Light plays an essential part in grass health. Supplementary to triggering photosynthesis, the energy carried by light is also used as a defence mechanism, warming up the soil during cold weather and drying the plant surface from morning dew or rain, considerably reducing the risk of disease infection and algae proliferation. Knowing this, it is easy to deduce that shade can be an enemy to your turf, even worse on greens, as the short mowing height reduces the leaf blade surface, consequently reducing the caption of light for photosynthesis. During winter the problem is aggravated through reduced sunlight hours, longer shadows and the cold. If you notice that a certain area of your course has very thin and weak turf or is lacking coverage, and if the environment is surrounded by trees, fences or other obstacles that may be filtering or impeding the grass to receive full sunlight, then high chances are that you are facing a shade problem. As we know, with regulations on golf courses, it is hard to remove such obstacles. Providing the plant the required energy for its full growth through a lighting rig would be your best bet. A lighting rig is an equipment developed to provide PAR (photosynthetically active radiation) light to grow plants. 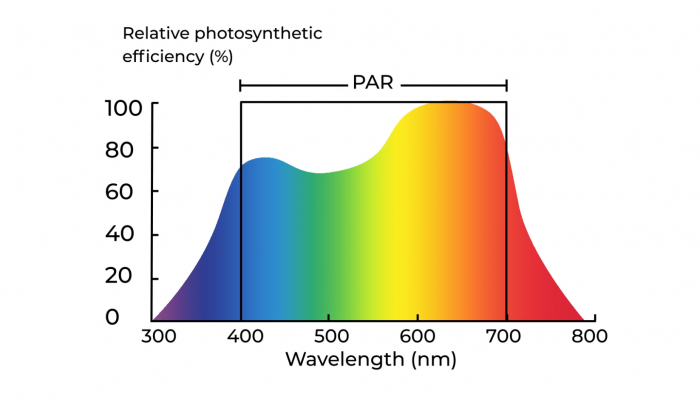 It refers to all the wavelengths of light between 400nm (violet, blue) and 700nm (deep red), which is exactly the kind of light / energy the grass needs. In general, lighting rigs are metal structures holding smart lamps that vary in wattage according to the need of the treated area. 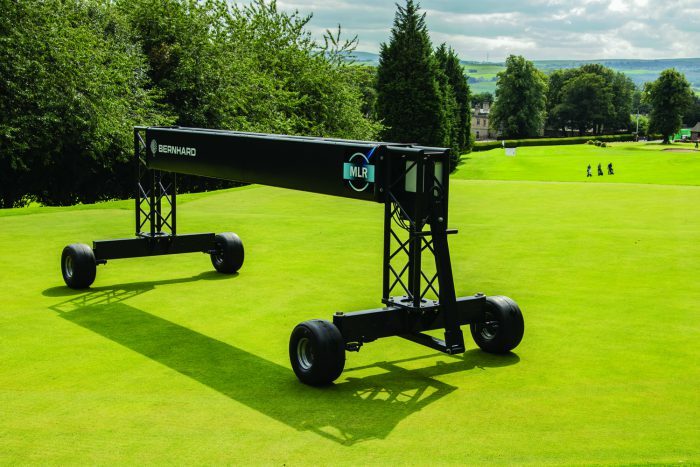 Greenhouses and stadiums have been taking advantage of this technology for years, and now, after a good amount of research and decades of experience, Bernhard and Company’s partner, MLR, has created a lighting rig specific for golf courses. Easy to use and to move, lighting rigs for the turf market can help promote grass growth, recover wear areas and improve the quality of grass by solving shade problems. It is used to treat turf areas that are suffering the effects of lack of light. When grass does not receive enough energy for photosynthesis, it will present thinner leaves, elongation of the blade, depletion of carbohydrate reserves and even the roots will be affected through depth reduction. Consequently, you will see an overall unhealth and unappealing grass that suffers more from damage from wear and is more susceptible to diseases. A lighting rig works as a substitute of natural light, providing to the plant enough energy for its own maintenance. 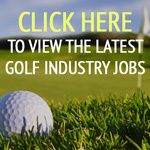 Highgate Golf Club is the closest 18-hole course to central London. Working with course manager, Derek Mason, Bernhard and Company proceeded with a trial with a light rig last year. The first green was remodeled in 2010, it was laid with a bent-fescue mix and since the beginning the grass did not establish well in some areas, becoming weak and poor in coverage. It was also possible to see algae formation. After analysing the causes through collection of soil nutrition information and nematodes population activity, it was found that the biggest problem on the green was the shade created by both the fence and trees located right behind it. To reduce the effect of shade on the first green at Highgate GC and facing the need for an immediate remedy, and a dedicated golf rig not being available then, Bernhard and Company placed its smallest rig at the time (Loki) at the end of February 2018. The trial was set to last a month. During the trial, the weather conditions worsened with the arrival of an unusual cold front that brought to Great Britain temperatures below zero and snow. The lighting rig was kept on even during the snowing days. Data was collected every two days during a period of 31 days. Root growth was measured on a weekly basis. By the end of the trial, it was possible to see an overall improvement of the green, even under difficult climate conditions. Colour appeared brighter. New shootings were emerging in the area that before had no turf and the crowns looked strong and healthy. Advancement in root growth was also verified through root measurement.